Tasty flavors to make your bread great: Natural Honey and delicious Sorghum Molasses. Honey--natural goodness at its best. Our Orange Blossom Honey is tart and tangy with a citrus flavor in generous one pound jars. 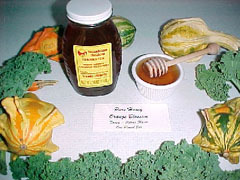 Clover Honey is sweet and mild flavored. For a natural treat great for lunch boxes and office snacking try our Honey Stix; pick one flavor or try the assortment. Sorghum Molasses (also known as Sweet Sorghum) is a thick, dark, sweet syrup made from sorghum cane. 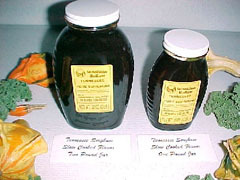 Sorghum Molasses has been produced since the 1850s. It is a great spread for biscuits and can also be used in a variety or recipes, such as baked beans and barbeque sauce. Version: i, February, 2007. Page generated 06:27 EDT; Thursday, April 18, 2019.